2013 Volkswagen Rock Up review | What Car? The Volkswagen Up Rock Up is one of two special edition Ups that have recently been launched. It's the most expensive Up you can buy and is available only in three-door form. It gets the same equipment as the High Up, but with two extra speakers, bringing the total to six. Outside, it's set apart by larger 16-inch alloys, a bodykit consisting of a spoiler, sideskirts and rear diffuser and black door mirrors, plus a grey 'sports' stripe. Tornado Red paint comes as standard, but Candy White (250) and Deep Black Pearl (495) are also available. What's the 2013 Volkswagen Up Rock Up like to drive? The Rock Up is available only with the 74bhp three-cylinder engine, so although it has to be revved to get going, it copes better out of town than the 59bhp engine that's available in lesser Ups. The engine is noisy when worked, but is relatively smooth and the hum fades away nicely at motorway cruising speeds. The steering is light and direct, and together with a low kerbweight and good body control, the Rock Up manages to feel pretty agile, making it ideal for nipping in and out of traffic. However, the Rock Up's bigger 16-inch alloys mean the ride isn't quite as supple as it is on cars with 14- or 15-inch wheels. The larger wheels pick up on broken surfaces around town, and larger obstacles such as speed bumps are felt more sharply in the cabin. There's also more road noise at higher speeds and, like all Ups, there's some wind noise to put up with, too. 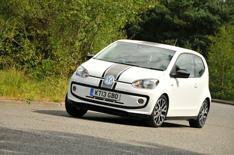 What's the 2013 Volkswagen Up Rock Up like inside? Inside, the Rock Up is near-identical to the High Up. That means class-leading build quality and plenty of head- and legroom for the driver. The steering wheel doesn't adjust for reach (it only goes up and down), but most drivers will still be able to get comfortable. The air-con controls are logically laid out, and the Rock Up's standard 'Maps and More' infotainment system (which features sat-nav), is controlled using a small touch-screen that clips on to the top of the dashboard. The system is both responsive and intuitive, although the tiny on-screen buttons can be difficult to hit on the move. In the back, there's enough room for a couple of adults to sit in comfort, and access is easy enough due to front seats that fold and slide forward. The boot is one of the biggest in the class, and dropping the standard split-folding rear seats opens up a large, square space with an almost flat base. The Rock Up gets a decent amount of kit, including air-con, Bluetooth (with music streaming), heated front seats, heated door mirrors and front foglights. The Rock Up costs 2080 more than our favourite version of VW's city car, the High Up, and that's a lot of money for a couple of extra speakers and a sportier look. In fact, if it's a decent sound system you're after, the special edition Groove Up is a better bet. That car misses out on the bodykit, but gets the same 16-inch alloy wheels, an even better six-speaker Fender sound system and is 1340 cheaper than the Rock Up. Even better, though, we'd recommend sticking with the cheaper and more comfortable High Up.